Over the last few weeks of term we had a lot taking place around the Academy, everyone was getting in the spirit with the run-up to Christmas. The Sixth Formers helped out with decorating the tree and central mall. The second to last week of term we had the DSP Enterprise Sale, many different stalls were set up down the central mall all trying to raise funds for the charity they were representing. Stalls included the Prom Comittee, Young Enterprise, different raffles and tombolas, jewellery and many more. It turned out to be very successful and all the stalls raised a lot of money. In the last week of term I went with David, Andile and Morium in the Sixth Form to another meeting for our campaign on getting a bus shelter outside the school gates. We are gradually getting closer and managing to get businesses on our side to help us achieve this. Another meeting will be held on January 15th with the county councillors to discuss further progress. On Tuesday on the last week of term, the music department held their annual Christmas Concert, which included solosists from Years 7, 10 and 13 that amazed friends and family. Also the Junior and Senior Concert band, the Choir, Woodwind Ensemble and String group all performed many brilliant pieces to the audience. It was a great night, and thank you to the Sixth Formers that helped throughout the evening. 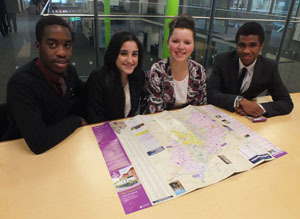 The Sixth Form Travel and Tourism group went on a trip to London, to visit all the popular attractions. The visited a variety of different places, including Winter Wonderland which then followed by a meal at Nando's where they met a special guest - Greg from District 3 off The X Factor! On Thursday in the last week of term the Sixth Formers had a meeting about a peer mentoring scheme that is being held by the organisation CAN. A representative from CAN came in to talk to us about what it involves and the training process we will be going through. We briefly know that we will be mentoring young teenagers who have had problems with alcohol and drugs but are on the road to recovery and we will be there for support. More on this will be followed next term. Over the last couple of weeks we have started petitioning for a bus shelter for the school. Andile, Morium, Ellie, Miss Farrar and I met councillor John McGhee and two bus companies, Stagecoach and Centrebus, to find out the means to get one for the school because we think it’d be a good development. It was a bit difficult pitching our thoughts because we had to think financially and practically, we needed to think about the cost because the bus companies need to make money. Cllr McGhee has given us some money towards it which is a good start for us. The sixth formers have been informed about the campaign but we’re thinking of officially telling everyone about it using something like a PowerPoint presentation. I’ve also been involved in the school basketball team this week, on Sunday we played against Ashby B at Market Harborough sports centre. We’ve also got a game this week against Bishop Stopford. It’s at home so it’d be great if people can come and support us. Last week my tutor group made a PowerPoint about the ups and downs of Year 11 to help with this year’s Year 11. We’re going to work as a team to present it, we had to each make our own individual slide to make it more interesting. Apart from that I’ve been busy working on my exams for January and focusing on my psychology and English. Being Head Boy has been interesting so far, I’m learning I need to be a role model for everyone. A lot of students come up to me and ask me things like where faculties are and some of them just come up and say hi. You get quite infamous around the school with lots of people saying ‘hey Head Boy’. It’s good because it shows people take the system of Head Boy and Head Girl seriously and know who we are. The last few weeks have been really busy with loads going on at CBA. We got back from Uganda, it was hard to get back into a routine again but I’m getting there now. It was a really, really good trip. We visited loads of different attractions and attended the Ginja International Youth Conference. We talked about global citizenship, sustainable development, social justice and international trade. We looked at is as a whole world perspective and how it was different in the UK to Uganda. It brought out a lot of how you take on different things and made you learn about a lot of different things. have been as successful! There’s 5 including me, everyone was really pleased with it all. I led the Senate meeting this morning, which was very daunting. It was my first one. It was hard to start off with but as I got into the flow of it it got easier. It was good. Everyone in the Senate has been taking on different projects to bring forward and to make improvements. It was Children in Need on Friday. We did a mufti day and cakes but we made so much, more than £1,200. For our next mufti day our target is much higher and we’re planning it for the end of the year. I helped out with a Gifted and Talented workshop on Saturday and the GUS concert the week before. For the concert David and I met the parents and showed them to the theatre. We did the refreshments in the interval too. 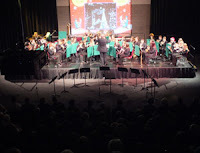 We nearly had a full house, it was a really good turn-out and the concert band, soloists and choir were brilliant. 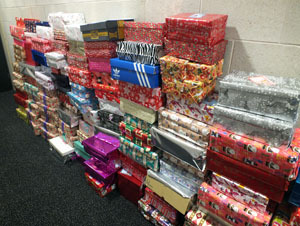 It’s going to be really busy for the next few weeks with Christmas on the way. We’re planning a meeting with council officers to try and get a shelter at the bus stop. There’s parent consultation weeks coming up so lots of people will be coming in to school. It’s always really nice at CBA at Christmas because we have a big Christmas tree and everyone gets in the spirit. 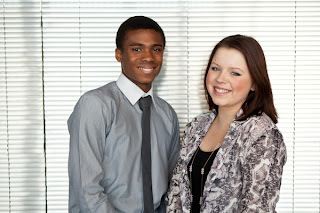 Corby Business Academy's Head Boy and Head Girl are Year 12 students David Graham and Ellie Mae Moore. David and Ellie Mae will be using this blog to give updates on their work in their roles over the school year. Since becoming Head Boy and Head Girl early in the school year David and Ellie Mae have been involved in school events including open week, CBA's Operation Christmas Child appeal and fundraising for the BBC Children in Need appeal.